I am personally not a chef but am married to one. Obviously I can’t speak for all chefs in the world as I haven’t met them all. However, having been married to a chef for 18 years and having interacted with quite a few chefs and their wives/husbands and significant others, I think it’s time to be truthful about this topic and put an end to this myth about how chefs eat at home. When my chef/husband comes home after a 12-16 hour day, he’s usually pretty hungry, thirsty and exhausted. He might have had something to eat before the dinner rush during the family meal at the restaurant, or he might have stopped at one of his favorite taco trucks on the way home. But if not, he’s starving! So what does he grab when he walks in the door? Yes, my husband is an Executive Chef of a large fine dining restaurant and the #1 food he eats after working a crazy amount of hours in a professional kitchen is Top Ramen. Now, I should be honest. 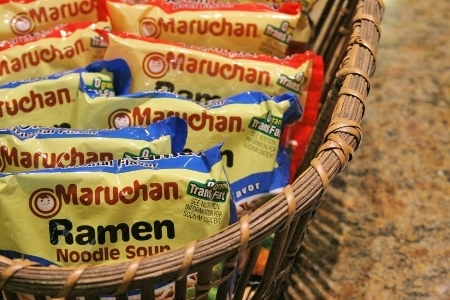 It’s not JUST Top Ramen. He throws whatever else he can find in the fridge into it as well and it’s always topped with Sriracha. But still, it’s Top Ramen. You’re right. Not all chefs do. Some eat frozen pizza, peanut butter and jelly sandwiches, cheese and Triscuits, Campbells soup, lunch meat and cheese, mac and cheese, spaghetti and meatballs, leftovers, ham sandwiches, black beans and tortillas smothered in Sriracha, graham crackers, chocolate milk, Vienna sausage and rice… the list could go on and on, but you get the picture. When I asked my fellow chef wives and significant others, this is what they said. Each one of their spouses has their own “comfort” food, the food they go to when they are exhausted. Now in all fairness, chefs do not eat like this all the time. When my chef/husband has a day off, we do eat well. Nothing fancy (usually), but he somehow makes whatever I had planned for dinner taste amazing. I look in the refrigerator and think we have nothing to eat. He looks in the refrigerator and creates dinner. The times he plans AND prepares the meal, it’s perfect and I eat way too much. That just doesn’t happen very often. So just to set the record straight, most chefs, after a crazy long day in the kitchen are not going home and preparing these amazing meals for themselves. They are eating to survive after working hard to prepare great food for the rest of us. So if you are a chef, or know someone who is, what do you eat after working a 12-16 hour day? Did your comfort food make the list above? We want to know! Feel free to add your favorite go-to food in the comments below. Follow Jennifer @ Emulsified Family’s board Chef Life on Pinterest. This post was also published on The Huffington Post. I honestly will just eat whatever I can find. Mainly junk food…. Haha! What if you can’t find anything? Fast food? My lovely man will it anything unhealthy and quick! Pizza, Chinese take out, Mexican from the crockpot, McDonald’s, lots of soup, spaghetti and yes… We have cases of Ramen noodles and bottles of spinach. Married to a chef for 10 years. Oh and anything the kids have leftover. Hotdogs, Mac and cheese, chicken nuggets. Healthy. 🙂 Leftovers are always good. I was going to ask what a bottle of spinach was – lol! Yuck!! Sriracha is a staple condiment in our home too!! 🙂 Thanks Margaret! Glad you found me! Even before I saw the picture, my guess was going to be easy, like a bowl of cereal. Granted, I might be projecting my desires there. When the boys allergies didn’t line up I was making two or three meals for dinner and there were times I was just burnt out and didn’t want to make something for myself so I grabbed cereal or instant mashed potatoes. I’m not a chef, but I can understand that exhaustion. I used to work at a catering company doing cooking all day. I think easy is the key! Cooking multiple meals because of allergies would be terribly exhausting! From how you worded it, sounds like it’s a bit easier now though. 🙂 Hope you don’t have to eat cereal for dinner too often! This post is SO accurate. My SO & I are both chefs with opposite schedules, so very often, one of us is home & we have exquisite homemade dinners. During the holiday season, Mother’s day or Valentine’s day, however, when we’re both pulling a 60 hour week, at best, it’s veggie quesadillas, mac & cheese with hot dogs, regular hot dogs, frozen turkey burgers, or Progresso tomato soup & grilled cheese sandwiches. At worst, it’s cereal, yogurt/fruit, or 24-hr fast food restaurant on the way home. While we are mexicans living in the caribbean, my housband always tries to bring mexican food that he prepares in his work, we really miss our food, so, eat that is like his way to start relaxing in home after a hard Day. Now caribbean people is starting to love mexican food hahaha. Sounds good! And what’s not to love about Mexican food???? We LOVE it!! Cheese and bread!! His favorite! Hello! I’m new here but I already have 4 years of suffering of the diseases “in love with a cook”! I totally agree with everything you said. It is difficult but love and support from both sides makes it work. I used to get the, “Can you start a Top Ramen” call almost every night! So funny!! Glad you found me! Glad to know I’m not the only one! Ramen noodles with anything in the fridge(usually tomatoes & cheese with a little butter & heavy cream. Yum! I’ve worked two jobs for a little over a year now, weighing in at just about 80-100 hours depending on what events and so forth. If I don’t eat family meal, it’s a TV dinner. Blah! I was raised on pretty much just Italian food so when I’m off, I turn to pastas and the like. One job is pastry, other is savory so at least I get a little bit of a switch up. After a full day of it all I want is an extra large glass of Dark Chocolate Almond Milk. Then a good, substantial breakfast the next morning. You forgot that some chefs like to eat a bottle of Jack. 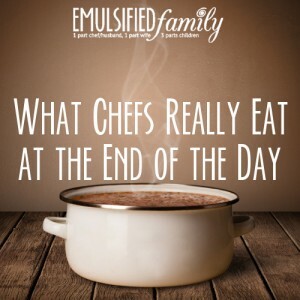 That would be a whole other post…What chefs like to drink at the end of the day! Hot dogs from a gas station. That actually sounds good to me right now. LOL. Wow, I just read my post. A lot of typos. My college proffesor would not approve as I was or am an English major, just a really tired one! I love your blog, and it’s very accurate to this lifestyle. I just wanted to add that most people think we and our children eat really well. While this is true sometimes, frozen pizzas are no stranger to our kids. Our truck serves Italian Bistro. Although we love Italian food we taste but rarely eat it anymore. Sara bakes Foccacia every morning to be served with our entrees, and if any is leftover we’ll sometimes cut it in half and make Prosciutto and Parmesan sandwiches on the flat top with mozzarella and sweet and hot peppers. We also plan our vacations around where we are going to eat! Been cooking in our family restaurant for 20 years Unless my wife makes something I can reheat it’s microwave burritos and a glass of half white half chocolate milk. Play with my son for a bit read him a story then off to bed. Oh so glad to have find you. My fiancee is a cook and he loves to eat fries. But usually he does not eat too much on a day. One meal usually, on better days two meals. There are even days when he doesn’t eat anything at all and he just comes home and sleeps. I am always asking him if he had eaten because sometimes I am concerned about his health. It’s so hard when they don’t eat well or eat much! I remember those days well and was always concerned like you are. Just keep encouraging him! !